The Firebox BBQ Pizza Oven is not like any other conventional pizza box but it is an addition to your existing BBQ grill. This pizza oven is definitely unique in comparison to the other ovens out there but you would be lying if you have not thought of using your BBQ grill to bake pizzas. The Firebox pizza oven comes to the rescue as all you need to do is add this bad boy to your grill and you can bake some perfectly crisp pizzas that taste nothing less than the ones you can make on professional pizza ovens. This oven is really useful for those who already own a Grill or are planning to get one which could help them cook pizzas as well. 1. It can be used right out of the box and there is no need for setting it up or undergoing the process of curing wood in the oven which is usually the case with outdoor pizza ovens. This oven makes the process easy as all you need to do is get it out of the box and start using it on your grill. 2. The oven is made up of stainless steel and keeps the temperature inside the box uniform, the makers claim that the oven reaches 400 degrees easily in less than 10 minutes. In reality, it can take 15-20 minutes for the oven to reach the ideal temperature depending on how the hotness of the BBQ grill. 3. The maximum size of the pizza cooked in this oven is 12 inches and it will take around 5-10 minutes for the pizza to cook perfectly. You might want to maintain an ideal temperature inside the pizza box so that the pizza cooks evenly without burning. 4. Cleaning the pizza box is going to be really easy as all you need to do is remove it from the BBQ, let it cool and then just wipe it with a damp cloth. It is not huge like other pizza ovens which make the maintenance of the oven easy. 5. It can easily reach higher temperatures as it is coupled with a grill and you cannot get this high temperature with most of the pizza ovens within the same price range. So, if you want a Neopolitan style pizza then you should surely take a look at the Firebox Pizza Oven. 1. The front of the pizza oven is open which means that there is a lot of heat that escapes and the temperature is not maintained constant especially if the weather is windy. This could be corrected by using a film that would cover the open part of the oven. 2. You can only cook one pizza at a time. If you want a larger pizza oven that can cook more than one pizza at a time then you should check out the Uuni 3 or the Uuni Pro. This one here is for family gatherings where you can cook one pizza at a time within 10-15 minutes. 3. The pizza is not cooked fast. On one side you have the Uuni 3 which cooks pizza in less than 60 seconds and on the other hand you have the Firebox Pizza Oven, which one would you choose? I would obviously go for the Uuni if I’m buying an oven to host parties and if I want to have an oven for cooking pizzas for my family then the Firebox Pizza oven is perfect. 4. You might want to learn how to cook pizzas in this type of an oven and it is going to take some time to perfect it. Overall, this pizza oven box is not that great and you can invest in the Bakerstone Pizza Oven which is a much better investment and it works great as well. If you already own a BBQ grill or are planning on getting one along with a pizza oven then this is a perfect addition. 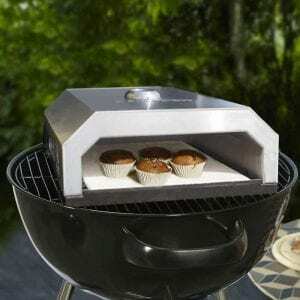 You do not need to get a separate pizza oven altogether and can easily use this with your existing BBQ grill. You need a charcoal or a gas burner barbeque in order to use this pizza oven and with its dimensions of 15cm H x 40cm W x 35cm D, the Firebox will fit most 3 or 4 burner gas BBQs or 22″+ charcoal BBQs. The Firebox Pizza Oven is a perfect buy for someone who has been looking at buying pizza ovens that would work well with their BBQ grills. If you want a separate pizza oven altogether that could make pizzas in less than a minute then you have to take a look at the Uuni 3 as it is a slightly more expensive but it is worth every penny spent. But for an addition to your existing grill, the Firebox Pizza oven is relatively good which means you can easily use it to make crispy crust pizzas without needing to buy a whole new $1000 outdoor pizza oven. Although it does not give you the taste that you can get from the authentic wood-fired pizza oven it does the job. 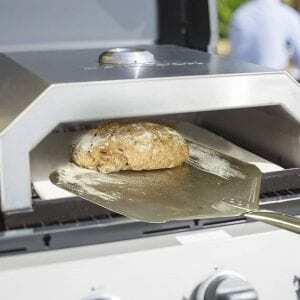 The pizza oven does have its own downsides like heat loss and takes time to cook pizzas, the Bakerstone Pizza Oven box is a better alternative altogether if you are looking for a pizza oven attachment for your grill. 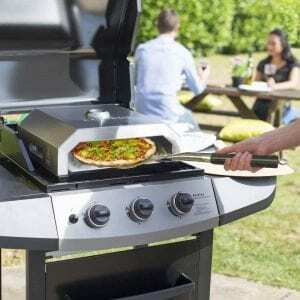 If you have tried this pizza oven then let us know your thoughts in the comments section below. In the case, you liked the post then share it on social media! There is nothing better than a freshly baked pizza from a wood burning oven. My sister has one in her house. My plan is to have a fire breathing dragon outdoor oven, but in the meantime something like the Firebox BBQ Pizza Oven would be a great addition for our grill. A question I have is does it develop the depth of flavor like a regular pizza oven, or does the metal take away from that? Well, I don’t understand what the depth of flavor might be for your taste buds but according to me I find the pizza cooked perfectly and it does taste like a Neapolitan pizza which is good enough. It is not as great as you might find in wood pizza ovens like Maximus but as of now it is pretty good! Nice pizza oven. The heat loss at both ends are inevitable but using a makeshift barrier or cardboard can divert wind away so that heat is not drawn away. It’s very compact in size and thus if you need to prepare a few pizzas for a party, you need to cater more time. Yes, actually you can do that but the heat retention was good enough for making pizzas. This BBQ pizza oven add on is so far the best that I have seen and it is one of my personal favorites as it cooks pizzas pretty fast!